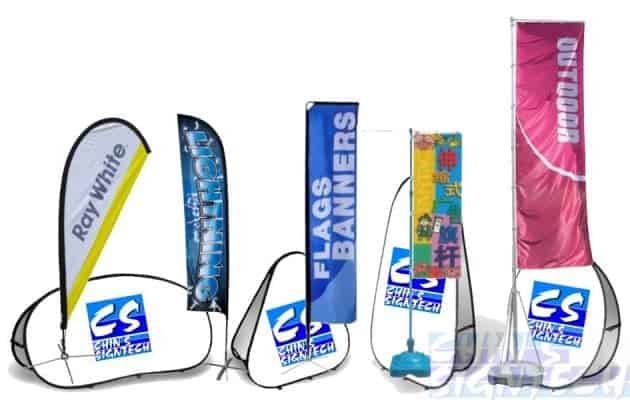 Outdoor Banner Stands and Flag Displays - waterproof & durable. Chin’s Signtech is a bespoke flag maker and offers a full range of versatile and portable promotional flag and outdoor display systems that are ideal for events, exhibitions, conferences and outside retail premises. We offer a choice of sizes and shapes to match budgets and requirements, and to make sure your brand stands out. These outdoor banner stands products are waterproof and more durable, designed to withstand moderate wind and weather conditions. Teardrop Flying banners get their name from their unique teardrop shape. suitable for any outdoor or indoor event or occasion! Feather Flags with their unique feather shape make a great display flag. Pop out in minutes for maximum branding and shelter for your road show ! 3 meter Flag Pole Banner With Water Base, cheap, portable and easily fixed. This telescopic aluminum banner pole extends to over 5 meters high, so you can be sure to get your message across.